The central government has announced the launch of the new scheme termed as Pradhan Mantri Sahaj Bijli Har Ghar Yojana. Under the newly launched scheme the central government has already announced that it aims at enlightening the lives of people living in rural and remote areas by providing them with electricity connection. The moment this scheme is implemented it is certain that each and every house in the rural area will be provided with uninterrupted power supply 24X7. The new scheme was launched under the leadership of Prime Minister of the country Shree Narendra Modi and his cabinet of ministers. The cabinet had announced the launch of the new scheme in a cabinet meeting held on Sep 17 on Pandit Deendayal Upadhyay’s Birth anniversary. According to the sources the new scheme will be fully implemented in the rural areas by December 2017. The process of implementation of the new scheme will also be fully functional within next three months time period in various rural areas and remote villages. Serving the purpose – Even if in the initial stage the scheme after implementation will offer benefit to both urban and rural areas, but the main aim of the central government is to try and provide with power supply to each home in the rural area. Evaluation factor – According to the sources the central government will begin with implementation process by mid year 2018. The overall evaluation can easily be done by 2019 year end. There are a number of legislative issues that needs to be resolved between the state and central government. Power consumption regulations – There are chances that central government will have to implement and alter few regulations as the central government aims at offering electricity to each residence within rural areas. It is certain that the government will have to purchase electricity from central government owned electricity generation plants. Use of solar and wind power – It is certain that to meet the growing demand of electricity the central government will try and generate more electricity from renewable sources like solar and wind power. The government has also made it very clear that electricity generated from renewable sources will cost them more due to high cost of power generation involved, thus reducing their profits. Bid placing for electricity – It is certain that the central government will try and monitor the process of placing bids for power. The process will be implemented by the government by 2017 December for generating 20,000 Mega Watts electricity using wind and solar energy. Green Power – It is certain that with the implementation of solar and wind power generation the state and central government aims at promoting the concept of using Green power supply. This will also help in maintaining thermal power generation plants to balance production of electricity. Promoting the concept of Digital India – With electricity reaching most homes in rural and remote villages it is certain that more number of people will get access to getting connected to digital India movement. It is certain that the central government has not yet stated full eligibility criteria to get registered under the scheme. In later stages as the scheme proceeds its implementation stage more announcements shall be made by the central government. In general the scheme will be valid for the people living in remote villages and rural areas who do not have any access to electricity in their homes. It is certain that to take advantage of the scheme you may have to belong to the Below Poverty Line category and Backward class category. To get registered it is certain that you may have to provide with proof of your residential address. This means that you may have to provide with details of your ration card, voters card, Aadhar card and Pan card. You also have to provide with proof of your income certificate along with other necessary documents. It is certain that the central government will also be providing with subsidy on electricity to rural households. So far no subsidy rates have been finalized by the central government. The central government has already made it very clear that it shall be offering with subsidy on purchase of equipments that are important for power connection including transformers, wires and connection meters. How to download Saubhayga App? Step 2: After going to this link from your PC or mobile phone you will have to click on “Install”. If you are using your Gmail account in more than one handset, then you will be asked to choose the handset and proceed. Step 3: Choose the device and then click on “Install”. Your app download will begin shortly on your handset. Android versions: It is available for all Android versions 4.0.3 and up. This means that it is compatible with most devices sold in the market today. Ratings: This device has got an overall 3.8 ratings. Thousands of people have already downloaded this app and are enrolling using it. Notifications: Upon logging in on this app, you will receive notifications of your electricity bill generation from time to time. This app will keep you up to date about your bills. OTP: When you first install this app, you will get a One Time Password on your mobile number which you have to put on this app and complete the verification process. 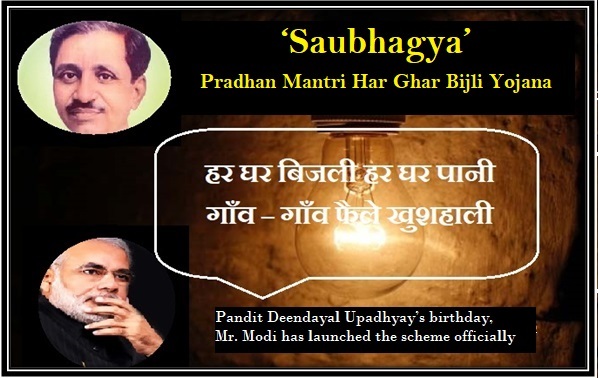 The official portal for the Saubhagya or Sahaj Bijli Scheme is www.saubhagya.gov.in. Out here you will be asked to fill out the registration form to enroll for the PMSBY scheme. Information portal: This is the portal where you will get all the information of the electricity. If you are registered on this portal you can get all information about the electrification process nearby you. Electrification camps: Through this portal you will learn where the electrification camps are going to be set next. So you can find out when they will come near you. Transparency: Through this portal the state government aims to induce accountability and ensure transparency for all steps leading to the electrification. Application form collection: This portal will also collect your application forms and it will help you register for this scheme more easily. You have to enter details like your bank account number, mobile number, name, etc. here. Through this portal and through the mobile app you can keep track of the progress of the scheme. How to register in Saubhayga Portal? Step 1: Go to their official website saubhagya.gov.in. On this, you will see that there is a “guest” button at the top right corner of this page. You can click on it to continue. Step 2: Or you can simply click “Sign up” because you will have to register on this portal at the end of the day. Step 3: On this page you will see that there is a form that asks you to enter all the details. So enter them carefully and after entering click “submit” which is at the bottom of the page. Step 4: After that you can loin on the portal anytime by simply entering your Login ID and password and complete the rest of the process. When you login, you will also be able to track the electrification procedure’s progress and the target achieved on a monthly basis. It will give you more personalized details based on your details. The new training programme has been launched within 6 states nation wide. The programmer is aimed at developing the manpower skills under Saubhagya Scheme within the Power sector for supporting 16320 crore such that over 4 crore families nationwide will be provided with electricity connections. The programme is aimed at offering right level of skill developmental training by 2018 fiscal year end. The new skill development training programme was officially announced by R K Singh – Union Minister as a part of Vocational training porgramme. The new programme has been launched in states of Madhya Pradesh, Assam, Uttar Pradesh, Jharkhand, Bihar and Odisha. The new programme has been announced to overcome the shortage of skilled professionals within Power sector for implementation of the Saubhagya Scheme. The new programme is expected to bridge the gap between launched scheme and Skill Development Ministry via partnership as announced by Power Ministry. The government will offer with right level of training to technical persons and lineman within six selected states for successful implementation. Uttar Pradesh Power Corporation Ltd. (UPPCL) is ready to meet the target of fitting 1 Crore electricity meters under Saubhagya Scheme in UP so as to provide electricity connection to every family, no matter if it is a rural family or an urban family “Pradhanmantri Sahaj Bijli Har Ghar Yojana” will provide electricity to every house in the country .With an aim to reduce risk of power swindling and minimize the line deficits. The government has allocated a total expenditure of Rs 1375 crores. Since there are prepaid meters to be installed UPPCL provision of recharging these pre-paid meters in advance,the minimal recharge amount will be of Rs 50.To avail this service people identity proof like Aadhar card, Voter id etc. will be required. This facility will try to reduce the corruption as there will be no manual element involved in meter reading, billing, and bill reconstruction. The Saubhagya Scheme has been initiated by the Modi government, and it aims to meet the requirements of 115 districts. It is one of the seven schemes that fall under Extended Gram Swaraj Abhiyan. The scheme under consideration would cover up to 48,929 rural areas meeting the requirements of the dwellers of that area. But still, it has been seen that this scheme fail to achieve its aims compared to others which have achieved more than 90% success in implementing its benefits among the mass. In regard to this scheme, it is also known that Uttar Pradesh did not receive the benefits of the scheme. Further, it has been stated that the central government has only succeeded to provide benefits to one-third of its target. As a result of this, the government could provide a power connection to only 1.14 crore houses in the rural areas. Then, in order to reach out and fulfill all its promised benefits, the central government has to speed up and put it more effort for the success of the scheme by the year 2019.